today we started off our morning by finishing off some of our unfinished work. We then had Arabic with teacher Salam, she introduced the letter - ع , and the students brainstormed for words that start with this letter. After Arabic we had calendar, and read our morning message "How many letters are in your name?" We then created a bar graph to see how many letters were in most people's names in our class. After that we worked on our guided reading booklet "1,2 buckle my shoe". In gym we played Simon says, and did some fun yoga, as well as the pizza game. In the afternoon we had a science lesson, where we introduced the 3 R's, reduce, reuse, and recycle. It was a very productive day alhamdulillah. We started the day off by working on our shapes booklet, we worked on the following shapes: star, and rhombus. We read a new chapter from Charlotte's Web, this is the chapter where Wilbur gets taken to the fair. The children are really excited to listen to this story, and they are getting very good at listening and learning new vocabulary masha'Allah. We worked on our phonics book #5, page 14. This page has different pictures with blank spaces under them, and we had to write the missing letters. Mashallah the children are doing a very good job of stretching out words to figure out what letters are used to write that word. This skill is essential for their writing in their future. Today we got to meet our two new classroom pets, they are Rocky and Emmet. The children got to choose and vote for the pets' names. The children had a short outdoor recess today, and then it started raining so they had to come back inside and watched an episode of Diego. Thank you so much to all of you that have sent in tissue boxes, and snacks. We started off our day today with learning about OCTAGONS! We learned that we can see octagons on the street in the form of stop signs. We practiced our 6 dua'as mashallah! We have memorized our March du'aa, ask your child to recite all of our du'aas to you at home. Unfortunately we didnt get to go the gym today as it was being used by the older grade's science fair. We had some indoor play instead. We had our biweekly reading buddies with the grade four class, followed by our very own comedy show! The children make silly faces, and jokes for their classroom friends. Have a great afternoon insha'Allah. Wednesdays are our favourite days because we start off our day with one full hour of educational play time. The aim of this play time is to encourage team work, collaboration, and conflict resolution strategies. These essential skills are vital for their success throughout the rest of their lives insha’Allah. We had a wonderful story read to us by Tr.Nancy in the library and we got to check out some books today Alhamdulillah. ( If your child forgot to bring back their library book, please send it back to school ASAP). We had outdoor play and enjoyed playing on the remaining snow piles Alhamdulillah. Today’s shape is hexagon! The children need to know that hexagons have 6-sides, and can be found in nature in the formation of beehives, subhanallah! We ended the day with a nice game of heads up seven up. We had a terrific Tuesday alhamdulillah. We were working on the following shapes during math: square, and rectangle. We wrote in our journals under the topic of "what we did during the March Break". Masha'Allah the children's writing is getting better and better! During GYM class we did our regular warm up followed by a competitive game of duck duck goose, pac-man, and ant tag. The children are becoming better and better at following the rules, and not crying whenever they get tagged out. We practiced reading our morning message as a group, and we enjoyed reading another chapter from Charlotte's Web. In phonics we learned the two sounds that -oo, and -OO make. 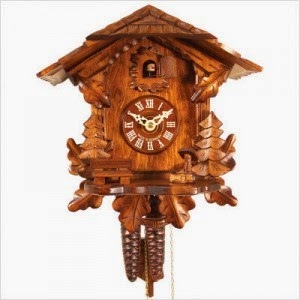 The children enjoyed learning the story of the cuckoo clock. We had so much fun outside today, the weather was relatively warm alhamdulillah. ​on the school library website. ​Have a great day, inshaAllah. SK 1&2 were practicing Surat " Al- Humazaah" and Surat " Attakathur" now insha'Allah they are practicing and memorizing Surat " Al -Kafeeroon" and applying tajweed rules.Please review and practice the above mentioned Surahs, Jazakum Allah Khairan. It is so nice to be back in the classroom after our 9 day break! We are still missing a few friends today, and we wish them all the best. We started off our day today with some educational centres, followed by our morning rug time routine. It was interesting to hear about all the exciting things the children had to share about their March Breaks. Exciting news was shared about loose teeth, new bunk beds, ski trips and much more! We are informally learning how to tell time on an analog clock. 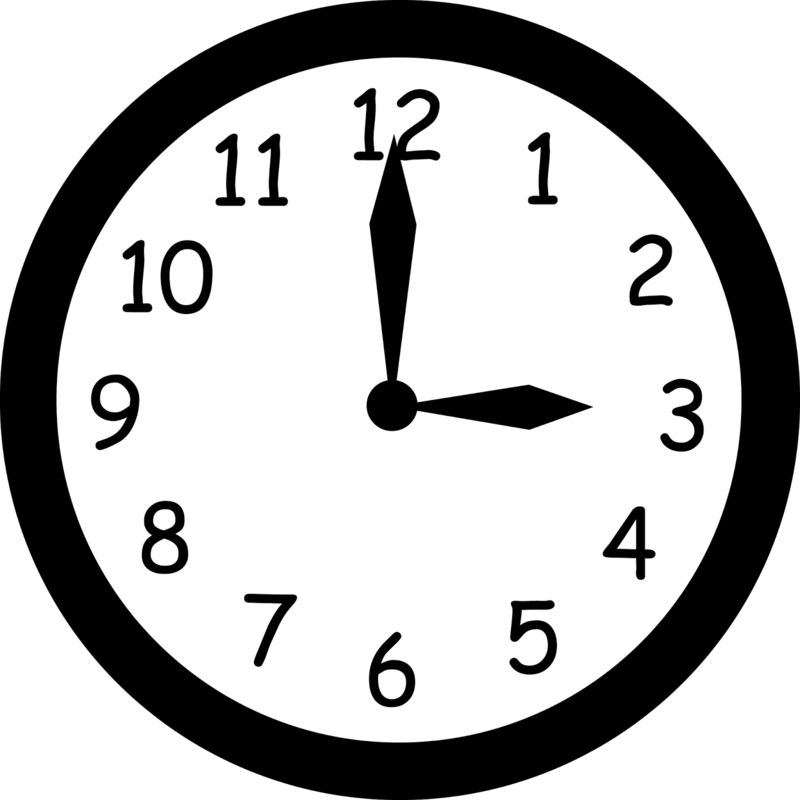 We have learned when to say o'clock, when to say __ : 15, when to say __:30. This is not part of our curriculum, just a little something they seemed interested in. In math we are working on our 2D-shapes unit, we practiced the following shapes: circle, oval, and triangle. We ended our day with Chapter 12 of our class book, Charlotte's Web. Show & Tell will be on hold for the upcoming 6-8 weeks insha'Allah as we will be focusing on reading and writing skills. If you haven't signed into Classroom Dojo for your child, please be sure to do so ASAP. In language we are working on the sounds -ng, and -v this week. In math we are working on the numbers 18-20, and we have started on our 2D shapes unit, which will be followed by the 3D shapes unit. In Islamic Studies we are working on our prayer unit, focusing on the names of the 5-daily prayers, and the number of rakaas in each prayer. In science we are wrapping up our food groups//healthy foods unit, and starting on our taking care of our planet theme. In gym class we had some fun races, and today we played floor hockey! In art (rhythm and movement) we have been working on listening to a beat and copying it using our classroom drum. We will be working on a craft made from shapes tomorrow insha'Allah. Today we made some delicious pizza! The children loved flattening the dough, adding the sauce, and sprinkling the cheese onto their pizzas. * There will be no homework for the week of the March break. ** There will be no show & tell for the remainder of March, and for the month of April. 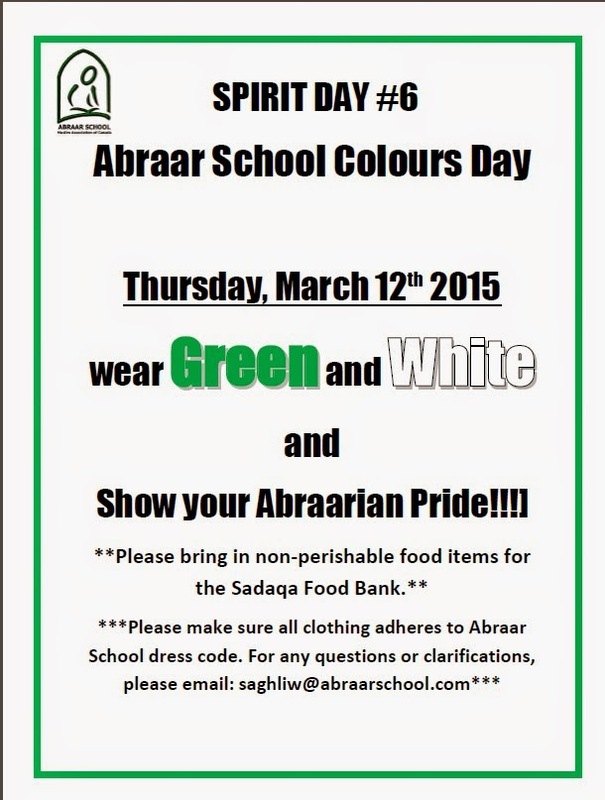 We will be using those periods for reading, and writing insha'Allah. Show & Tell will resume in May insha'Allah. What a beautiful winter day it was today, the weather was so nice and crisp alhamdulillah. On Wednesdays we start off our day with our themed centres for one hour from arrival. Some students did some patch-work coloring of Elmer the elephant, while others were tracing 2D shapes onto papers. Some were cup stacking, while others were building forts. Alhamdulillah, it was a nice start to our day. We read one chapter from our Charlotte's Web big book, the children really enjoy being read to and learning new words masha'Allah. We had our first school lock down drill today. The students have been practicing this week, and they did an amazing job of huddling together and hiding quietly until it was safe to come out. Insha'Allah we will never be put in a situation where we have to perform this safety measure. But if we do, we are ready! Our class had a shorter than usual library visit today because of the lock down, and so we didnt get a chance to select book. Teacher Nancy read us a nice story about a bear that wants to be left alone to hibernate. We worked on our math booklets, and had a great time listening to everyone's show & tell. Two of our friends were greatly missed today, we look forward to having them rejoin our class soon insha'Allah. Looking forward to an awesome remainder of the week. We had a wonderful day today filled with fun, and excitement alhamdulillah. We started off our day by writing out the number 16 in our numbers booklet. In Arabic the children are learning a new letter, the letter -Taa as in Ta'ira (airplane). The kids brought in a nice variety of objects, and everyone was being a really good audience and asking excellent open-ended questions. In gym class we played the Circle of Life game, followed by Pac-Man. Some of the students are still struggling with winning/losing, and we are practicing. We read a wonderful story about being different, and accepting each other even though we may be different. 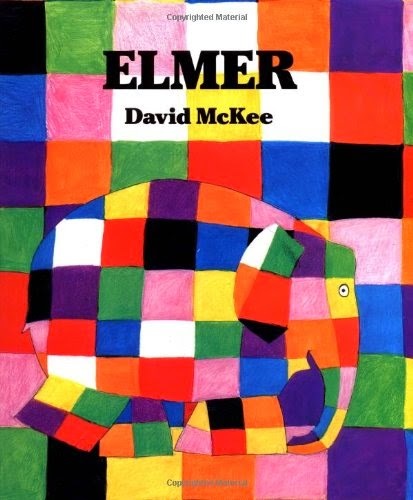 The story is about a colorful elephant named Elmer. Ask your child about this story, and the other Elmer stories we have read, and discussed. We worked on our Healthy Snacking booklets, and students should be bringing them home today. Alhamdulillah, it was a very blessed day. - Tomorrow is our town hall meeting from 2:30 to 3:30. - Please don't forget your child's snow pants, and snow gear. Many students are coming in without snow pants and proper winter gloves/mitts. Congratulations to the winners and all pariticipants. Masha'Allah for the great efforts they put toward Quran memorization. In Quran class both classes finished Surat " Al Humazaah" and now they are practicing Tajweed Rules and memorizing Surat " Attakathur". Jazakum Allahu Khairan for your support at home.